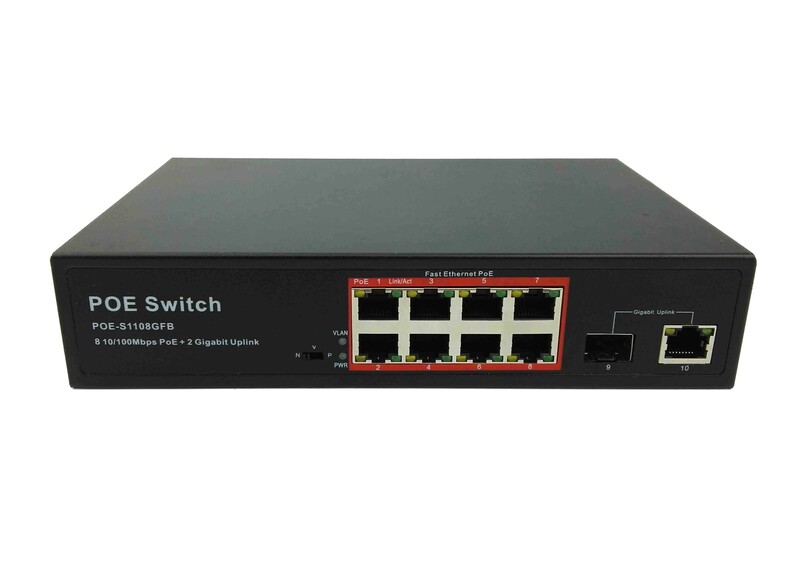 POE-S1108GFB, 8 port Fast Ethernet unmanaged Power over Ethernet switch, complying with IEEE802.3af/at and equipping with 150W internal power supply source, which enables it to compatible with powered devices such as IP CCTV camera, Wireless Access Point, Voice over Internet Protocol, Intelligent Access Control, etc. Except powered by built-in power source, equipped with DC48-57V external power supply is also workable for POE-S1108GFB as required, which makes it flexible in power supplying mode. 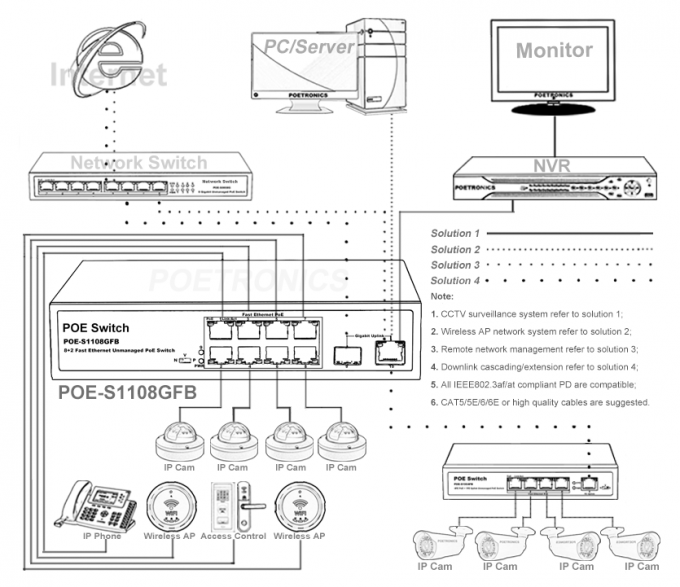 There also has three different system modes (Free communication, VLAN port isolation and IP surveillance transmission) switchable in accordance with different conditions or requirements. Every single port output power up to 30W max and transmit through pins 1,2 "+" and pins 3,6 "-" over standard Ethernet cable Cat5 or Cat5e, Cat6, Cat6e or higher quality ones that will finally reduce power loss in the transmission especially for the Ethernet power system that has a long distance between Power Source Equipment(PSE) and Powered Device(PD). 8 port 10/100Mbps POE + 1 port Gigabit RJ45 uplink + 1 port Gigabit SFP uplink. Auto MDI/MDIX, Store-and-forward, Self-adaption, 5.6G bandwidth. Compliance with IEEE802.3, IEEE802.3u, IEEE802.3ab and IEEE802.3af/at. AC100-240V and DC48-57V two different power supply modes. Max 30W each port, total rated power output 150W. Plug and play, grounding connection, lightning protection, 19’’ rack mountable. PoE running status can be read and analyzed through corresponding LED indicators.